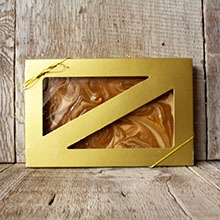 Creamy vanilla fudge mixed with generous amounts of caramel resulting in rich caramel fudge in the Latin tradition of Dulce de Leche. This will soon become your new favorite fudge. Packaged in a 16 oz. decorative gift box.